As cool fresh winds bring a promise of clear winter skies and the morning chill starts to bite, our Kloofing season comes to an end. With cool temperatures and little rain making the gorge cold and dry, we put the adventure on hold from the end of May till the first good spring rains in October. So if you would like to get a Kloofing adventure in before the end of May, book now! What do we do in winter…? CLIMB, yip it’s the best time of year for getting to grips with rock. For those of you who don’t know, we do an Introductory Climbing Course for which you need absolutely no prior experience or knowledge, it’s great, you’ll spend the day out on the rocks, we’ll show you ‘the ropes’ and you can discover it’s not so difficult! After the Intro course, join us for the Sport Climbing course, it builds on the knowledge of our Intro course and gives you the technical skills to start tackling routes on your own – best kept secret about this course… the crags face the sun so it’s nice and toasty in winter! You can book our courses any time, but we’re offering a Friday afternoon slot for the Sport Climbing course, so bunk off work for a few hours and start your weekend Climbing. After that, well, we can offer you more advanced Trad Climbing courses, our ever popular Sentinel Peak Climb in the Drakensberg or if you want to get serious about climbing, join us on our Adventure Weekend, it’s an intensive two days of climbing and abseiling, where we concentrate on furthering your technical climbing and Abseiling skills, expose you to multi-pitch Sport routes and encourage you to climb higher grades. Want to get more serious? Enquire about our Technical Climbing Clinic, it’s a focused program to get you to improve your climbing dramatically. 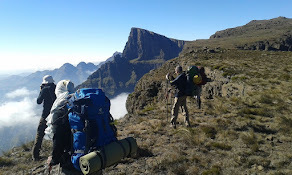 Our Gauteng School of Mountaineering and Adventure training is in full swing, we’ve held our first professional courses for upcoming guides, but have also received an overwhelming interest in our recreational advanced climbing courses and the rope skills courses for adventure racers. Oh, don’t forget we can do your First Aid courses as well. Do keep us in mind if you want comprehensive training in Abseiling, climbing and Mountain walking, rope skills or first aid. The dates below, can change, they get booked up and so ask us to make sure!